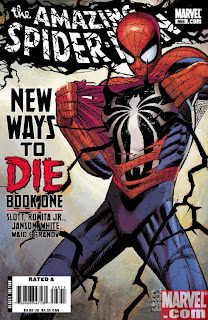 Comics Impulse v2: Venom teaches Spidey "New Ways To Die"
Venom teaches Spidey "New Ways To Die"
Peter Parker's survived a Brand New Day--but now he's about to discover New Ways To Die in the double-sized Amazing Spider-Man #568, on-sale today! 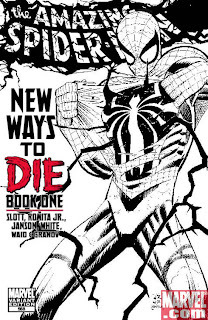 Kicking off the hotly anticipated "New Ways To Die" storyline, from acclaimed scribe Dan Slott and legendary artist John Romita Jr, Spider-Man's about to face off against Menace and...the Thunderbolts! 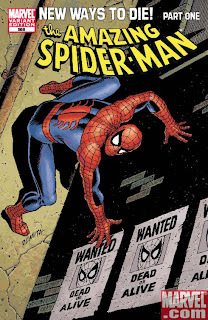 Why does Norman Osborn have his eye on Peter Parker? Why has he chosen to re-enter Peter's life now? Now's your chance to get in on the ground floor for the story that introduced the all-new Anti-Venom...but just who or what is it? How is it connected to Venom? There's only one way to find out, True Believer--swing over to your local comic book store and discover Amazing Spider-Man #568, today! 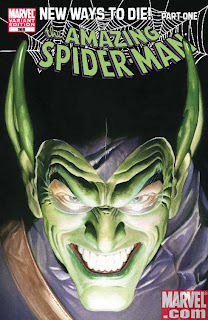 Plus, don't miss variant covers from industry heavyweights Alex Ross, John Romita Sr and John Romita Jr! 50/50 Cover by JOHN ROMITA JR.